Like most women say, there is no such thing as having too many shoes. A significantly smaller percentage thinks otherwise, being minimalist at heart or minimalist by circumstances. However, what both categories have in common is hating to part with their shoes – whether they just loved those for the look but hardly ever wore, or have really discovered the most comfortable pair and had it for years. Occasionally, overcoming that difficulty and getting rid of certain pairs to make room in your closet is worth the pain. Donating is the first thing that comes to mind regarding shoes that were rarely worn or outgrown by kids before showing any real wear. Are your shoes scuffed, stained or showing other signs of wear and tear? Painting may be a quick fix, but decoupage is the magic trick that can turn an unsightly thing into a lovely decorative item, or even grant it another chance of serving for its original purpose. 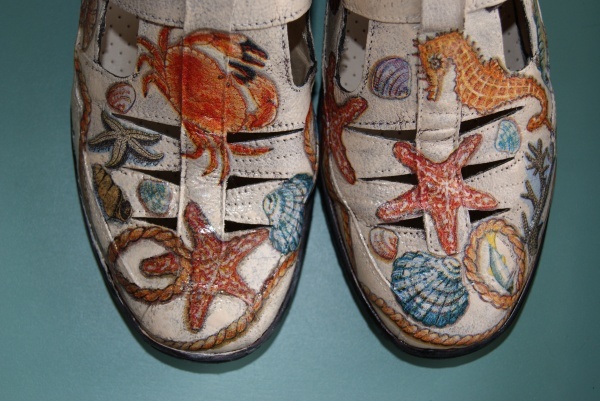 Decoupage is a great way to give shoes a total facelift, as it helps to conceal a variety of ugly marks, even cracks or dents, deep scratches or scuffs. A fancy-sounding word ‘decoupage’ stands for a process that is not complicated. Actually, handling and positioning fragile fragments of paper napkins can be challenging, as well as covering your shoes with fabric (though there are many tutorials online that may be helpful). However, there are lots of simpler ways to improvise within the good old Mod Podge technique. 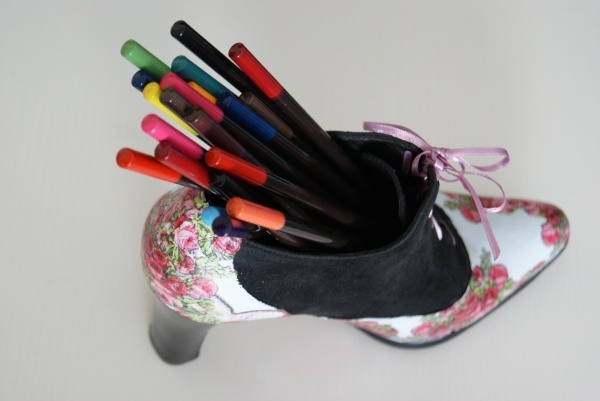 Shoes can be decorated with lace, twine or yarn, with fragments of maps, book or magazine pages, and even postage stamps – all of these are a lot easier to use as decorating material for creating your own unique design. A final coating of acrylic varnish will make it waterproof and more durable. If this still seems like too much work, you can simply use paint, lace, glitter or rhinestones only on the toes or heels of your shoes. 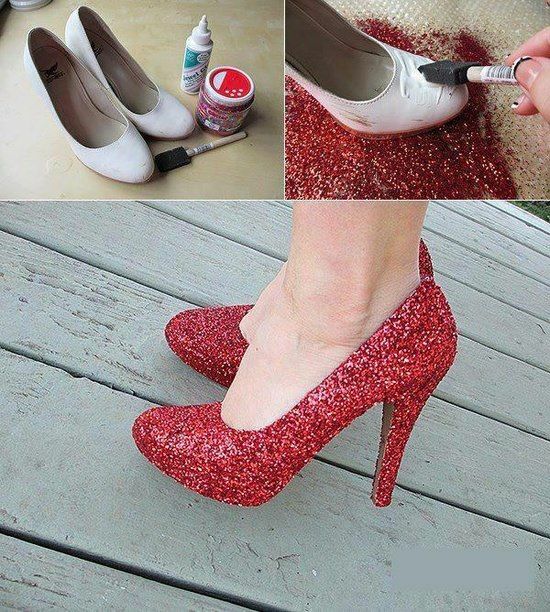 You can just spray paint or sponge paint shoes or boots picking a color you like or a combination of colors. Continue wearing and enjoying your renewed and re-styled shoes. Or else, put them somewhere for everybody to see and admire. Do you find these newly re-decorated shoes too pretty to wear? Display them as a work of art in your house, placing them into a niche, on a shelf or a dresser. Boring drawers? Not anymore! 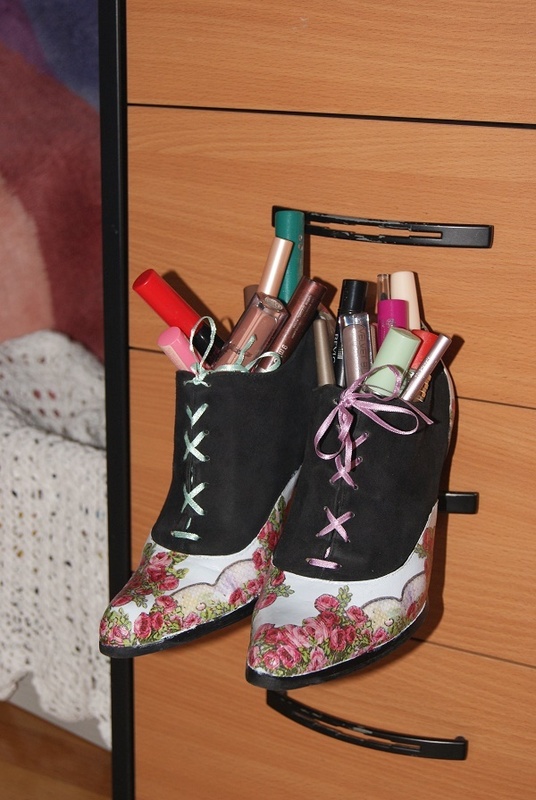 Besides, you can turn these shoes into elegant storage for small items that tend to clutter desks, shelves, and countertops. Upgrading old shoes to a unique creation should mean ‘proudly wearable,’ but this is not always the case. Sometimes one of your shoes is damaged beyond saving (like, if your dog has chewed it), leaving you wondering what to do with another one. Here is the good news: you have perfect material for trying out any of the re-styling decorating ideas mentioned above or found elsewhere – no big deal if your first experiment does not turn out so well. 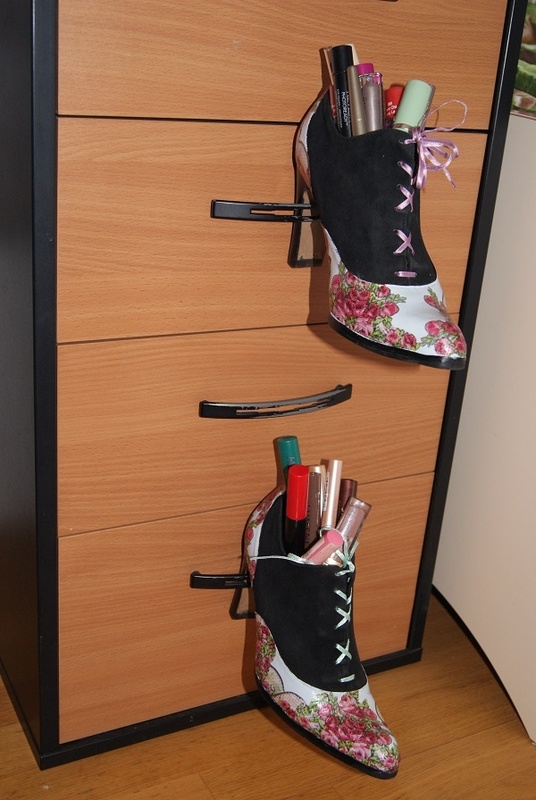 More good news: there are different ways to use just one shoe or boot – as a planter, cache-pot or vase, as a stationery or makeup organizer. 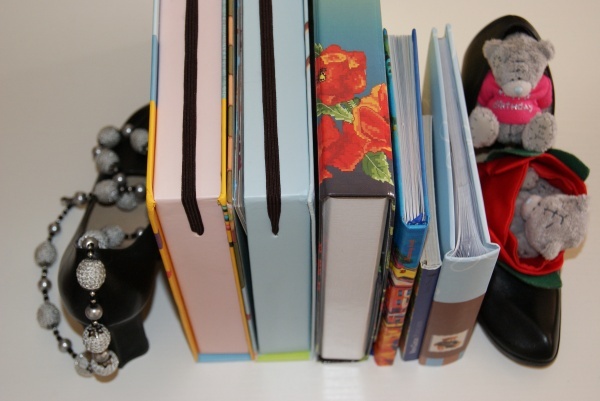 It can also hold buttons, beads, and other easy-to-lose craft or scrapbooking supplies that need a home. 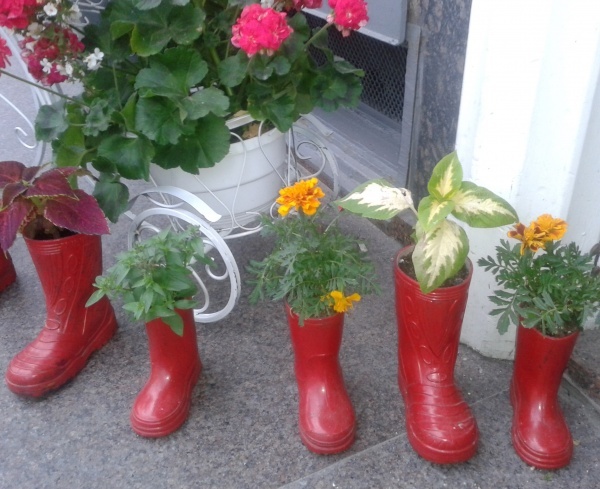 Small potted plants can be placed into shoes and boots, as well as freshly cut flowers. 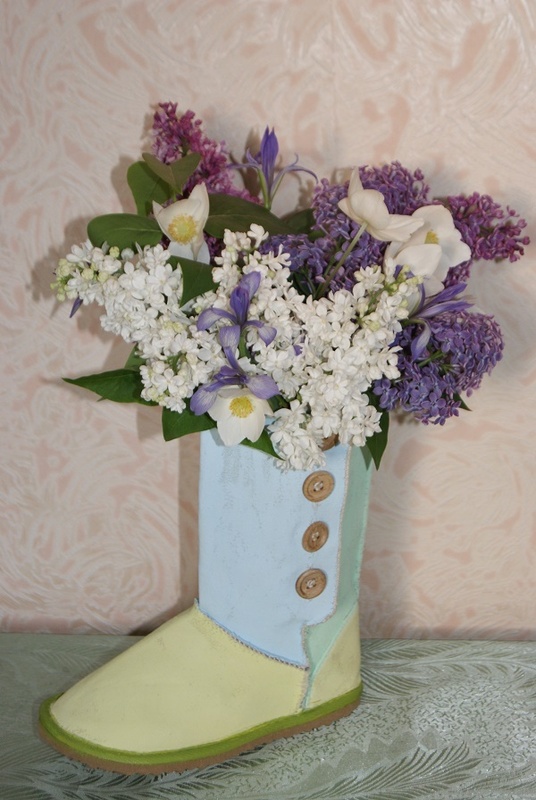 Ankle boots and rain boots make the best vases, but you can place fresh flowers even into small kids’ shoes and boots. Just cut off the bottom part of a plastic water bottle or some other plastic container so that it fits inside, then fill it with water and add the flowers, choosing their size and trimming their stems accordingly. Preferably use flat or low-heeled footwear for this so that it is sturdy. Probably the easiest way of reusing a shoe or two that are beyond wearing is turning these into planters. You can certainly coat them with paint or add lovely details, and place them on your window-sill, on your patio or front steps. 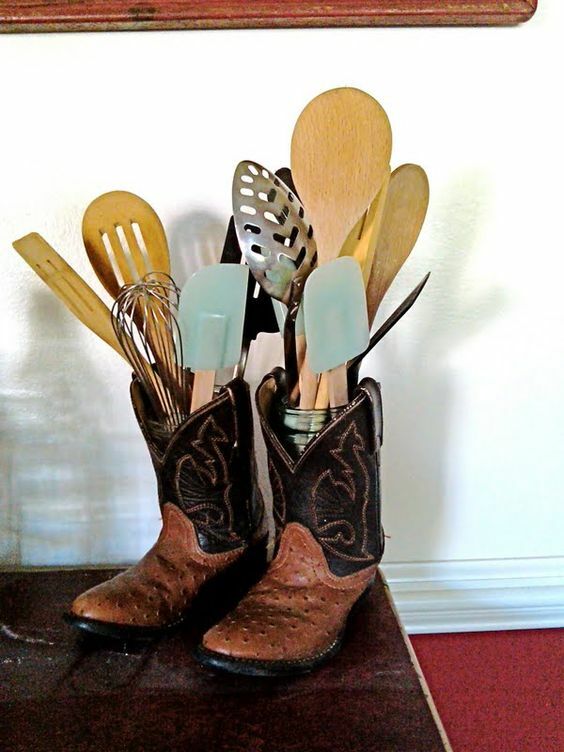 But you might as well change nothing about your muddy old boots or running shoes prior to giving them a new green life as planters in your garden or backyard. This is a perfect idea for shoes that get a crack or hole in the sole – this means they already have a drainage hole. If they don’t, you need to make one with a screwdriver or a drill. 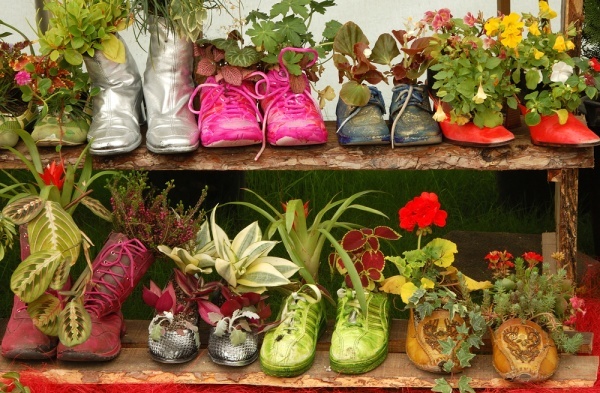 Reusing shoes, boots, and crocs as planters is an easy and frugal way to add some color and a fun theme to the garden, or make practical use of vertical space in small places. It is also a great idea for a project that will get your kids out into the garden. They will be excited to have their own shoe garden, which can be very colorful or even edible if you opt for shallow rooted leafy veggies and herbs. Isn’t it so much fun that after you have grown out of your shoes, you can start growing into them – this time, literally? Have some high heels that seemed fairly comfortable at the store proved to be non-wearable? Do they have long pointed toes that make walking in them anything but safe? We all are sometimes disappointed with the most gorgeous shoes not fitting right, but still, wish we could keep them even though we can’t wear them. 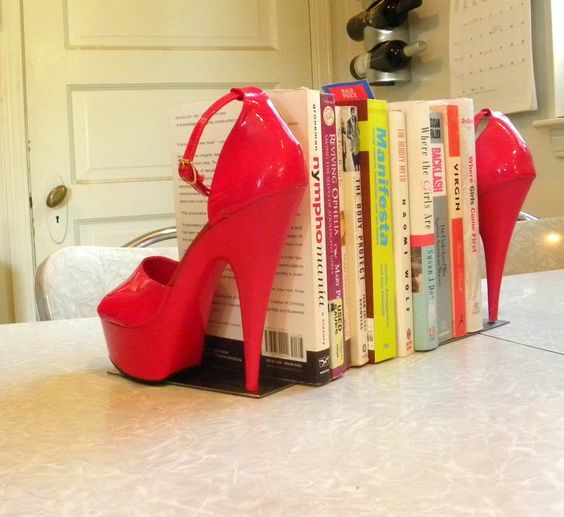 A pair of barely used or spray-painted high heels makes great bookends. You have probably seen cute pictures of umbrellas comfortably resting in rain boots – oh, aren’t they a perfect company? In fact, these ‘boots’ are ceramic and cost a pretty penny. Many people must have been wondering if they could just use their old rain boots instead, getting the same look and saving the money. Well, yes, but no, unless you attach these boots to a wall, a bench or some other fairly big and sturdy item. Otherwise, they will keep falling over. However, there is an easier way to do it. 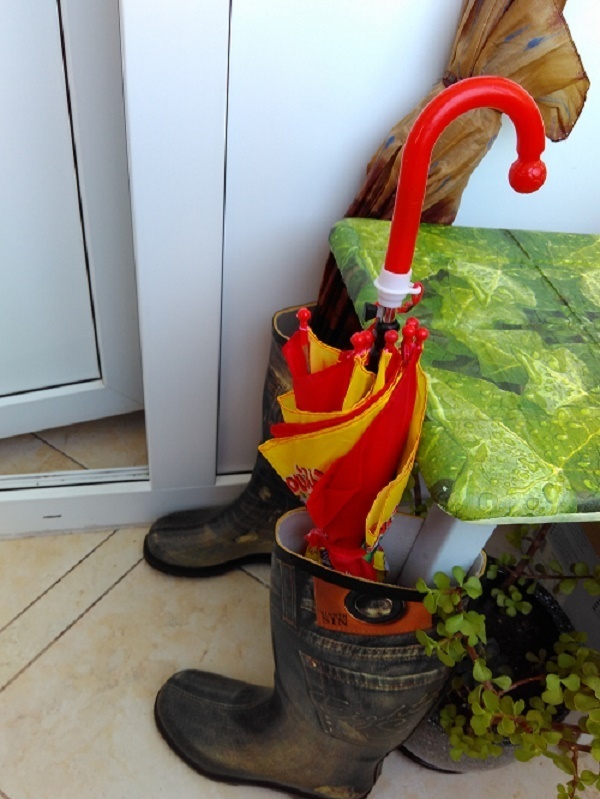 Take a stool chair and place its legs inside the rain boots – these can now hold your umbrellas without falling. If you have two pairs of rain boots, your stool chair will be wearing a boot on each of its legs and looking quite stylish. If you don’t, you can use some other old boots for the other two legs. Such stool chair is not very good for sitting, but it can function as a small additional shelf where you put your bag, hat, gloves or other essentials. 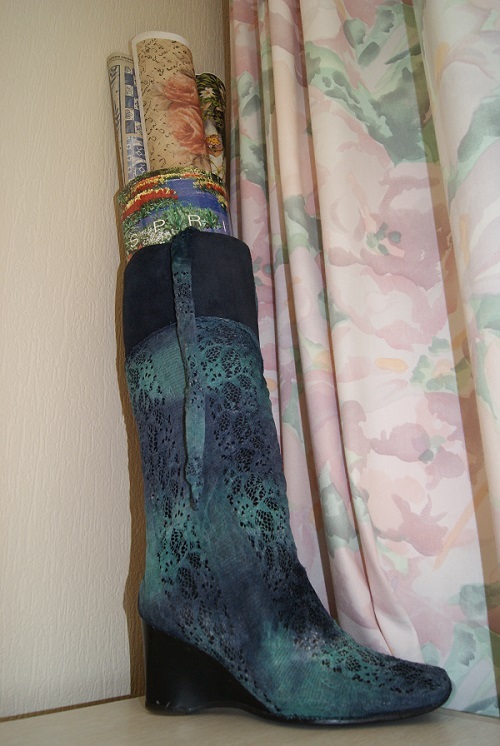 Knee boots or rain boots, depending on their size, might look like something that won’t contain a lot, but they can add lovely accents to your room as they hold gift wrap, rolled-up posters, newspapers, magazines, art and craft supplies. Even if you have a separate area or closet dedicated to your hobby, you may appreciate more variety than just bins and boxes. Baby shoes are probably the most adorable of all you have ever owned. 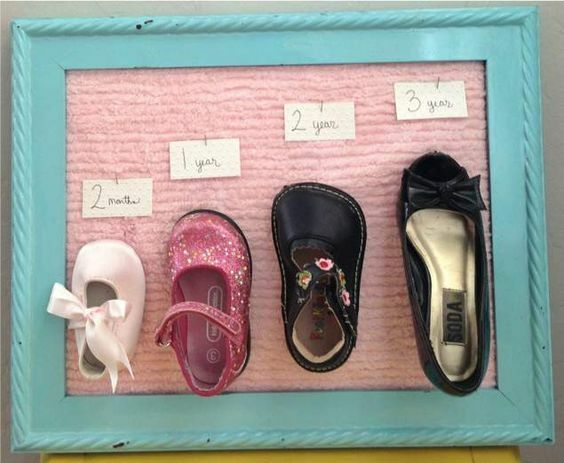 If you don’t feel like parting with some especially cute baby shoes, you can use them as a creative growth chart labeling them with the appropriate ages. This kind of growth chart is much prettier than any other, letting you preserve some of these special memories. Reusing things to hide cash inside while traveling (such as old lipstick tubes or foundation compacts) is not a new idea, just as the classic ‘shoe money,’ but experienced thieves will know these tricks. However, when it comes to hiding money in the house, some worn-out shoes in your closet or garage definitely are not a place where a burglar would look for cash. Even if this ever becomes as popular as the traveling ‘shoe money,’ there is simply too many shoes in any house to go through them in search for money. 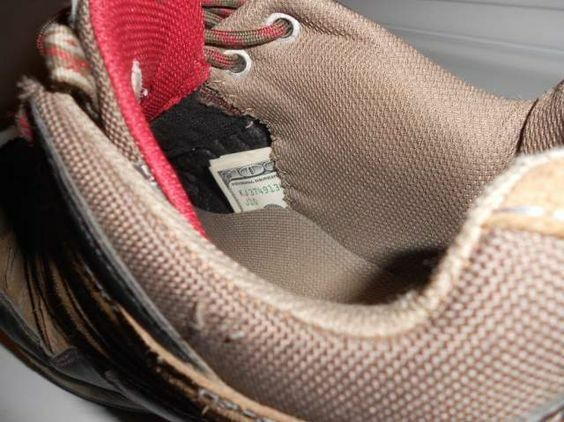 You can hide cash inside shoes in different creative ways, depending on their style and material. But making a ‘pocket’ in the textile siding of sneakers or putting money under the inside sole of a shoe are probably the easiest ones. Just make sure someone else in your family does not accidentally throw the money-hiding pair out. Just because you can’t wear a pair of shoes anymore doesn’t mean you need to throw then into the trash. There are many creative ways shoes can be repurposed into something beautiful and useful, especially if you still want to keep them because they remind you of special moments and people in your life. What are some of your ideas for transforming an old pair of shoes into something that will have a new use?